Get the full, one week Sziget experience with Foo FIghters, Ed Sheeran, Florence + The Machine, Post Malone, Twenty One Pilots, The 1975, The National, Martin Garrix and many more! Arrive early to secure the best available camping spot. Early moving in possibility with Moving-in 3-Day Pass or Moving-in Tuesday Ticket. See Ed Sheeran play live on 7 August 2019! Check out Florence + The Machine live on 12 August 2019! Make sure to see Twenty One Pilots live on 13 August 2019! Check out Martin Garrix live on 9 August 2019! Check out The 1975 live on 8 August 2019! Attend the best festival concerts of the summer! Become a Szitizen! Make new friends, party with old ones and create unforgettable memories! Explore and fall in love with the captivating city of Budapest! Immerse yourself in the super unique Sziget vibe! Choose from an awesome variety of accommodation options! Can't finance your 7-Day Pass just yet? Don't worry! Purchase it in 5,4 or 3 instalments and pay for it over a period of 5, 4 or 3 months. This product offers the same services as the 7-Day Pass, but you pay for it in 5,4 or 3 instalments. Please find a detailed description HERE. Quick entry possibility through the vip lane at the festival’s main entrance. Join the Love Revolution for 5 full days and enjoy the show of Ed Sheeran, Post Malone, The 1975, The National, Martin Garrix and many more! Come and see The 1975 live on 8 August 2019! Enjoy 5 days of Freedom with the shows of Florence + The Machine, Post Malone, The 1975, The National, Martin Garrix and many more! Make sure to see The 1975 live on 8 August 2019! Treat yourself to 5 days of Love and Freedom in the heart of Budapest with Foo FIghters, Florence + The Machine, Post Malone, Twenty One Pilots, The National, Martin Garrix and many more! Check out Foo Fighters live on 13 August 2019! Check out Twenty One Pilots live on 13 August 2019! Come and see Martin Garrix live on 9 August 2019! Get a 3-day taste of Sziget, party from Wednesday until Friday and check out the show of Ed Sheeran, Martin Garrix, The 1975 and many more! Get a 3-day taste of Sziget, party from Thursday until Saturday and check out the show of Martin Garrix, The 1975, The National and many more! Get a 3-day taste of Sziget, party from Friday until Sunday and check out the show of Post Malone, Martin Garrix, The National and many more! Get a 3-day taste of Sziget, party from Saturday until Monday and check out the show of Florence + the Machine, Post Malone, The National and many more! Don't miss Florence + the Machine live on 12 August 2019! Get a 3-day taste of Sziget, party from Sunday until Tuesday and check out the shows of Foo Fighters, Florence + the Machine, Post Malone, Twenty One Pilots and many more! Check out the Foo Fighters live on 13 August 2019! Don't miss out on Florence + the Machine live on 12 August 2019! Make sure to check out Twenty One Pilots live on 13 August 2019! See Ed Sheeran and enjoy a full day of programs at Sziget 2019! Enjoy a full day of programs with The 1975 and many more! Enjoy a full day of programs at Sziget with Martin Garrix and many more! 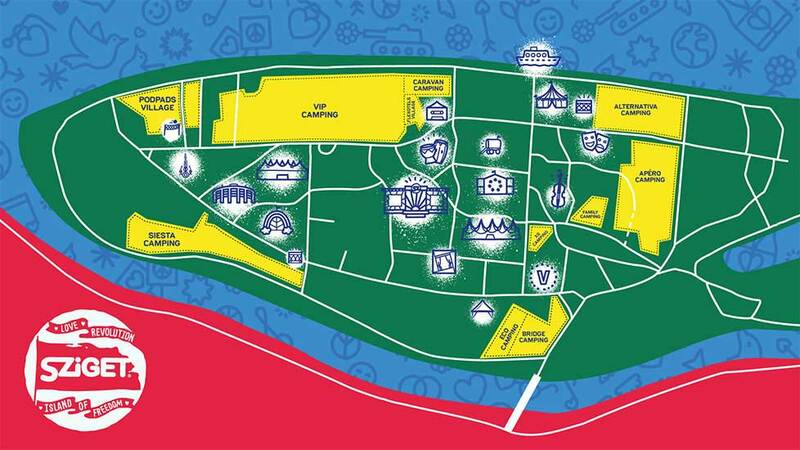 Enjoy a full day of programs at Sziget 2019 with The National and many more! Enjoy a full day of programs at Sziget with Post Malone and many more! Enjoy a full day of programs with Florence + The Machine and many more! See Florence + the Machine perform live on 12 August 2019! Enjoy a full day of programs with Foo Fighters, Twenty One Pilots and many more! Don't miss out on Twenty One Pilots live on 13 August 2019! Be one of the first settlers and move-in to the island as early as possible while enjoying Budapest! Arrive a day earlier and move-in to the island and get settled before the party starts! Get the full, one week Sziget experience with Ed Sheeran and secure your limited Szitizen Prime goodie bag now! You will receive all instructions on how to get your goodie bag from szigetstore.com in an e-mail after your purchase was successful. Please make sure to check your spam folder as well. Be among the first to buy your ticket and receive an exclusive Szitizen Prime gift pack! Become a Szitizen Prime and join the Love Revolution for 5 full days and enjoy the show of Ed Sheeran and many more! Get your exclusive Szitizen Prime goodie bag now and enjoy 5 days of Freedom! Treat yourself to 5 days of Love and Freedom in the heart of Budapest and get an exclusive Szitizen Prime goodie bag as well! Swimming pool, extra services and a very nice area to refill yourself when it comes to relaxing! Available space for tents: 2x2 meters (for 1-2 persons), 4x2 meters (for 3-4 persons). Please follow the instructions of the on-spot personnel. Make sure you keep your most precious valuables as safe as possible and charge them at the same time! Only valid together with a VIP camping ticket! The most comfort you can get in a tent! An upgrade camping where you can enjoy extra services, Italian food and many more! Early move in possibility with Moving-in 3 Days Pass or Moving-in Tuesday Ticket. Only valid together with an Alternativa camping ticket! Your own little home for your time at Sziget! Special accommodation for our very special Szitizens! Only valid together with a Alternativa Camping ticket! An upgrade camping with many features, unique atmosphere and French hospitality! Only valid together with an Apero camping ticket! Early exchange possibility with Moving-in 3 Days Pass or Moving-in Tuesday Ticket. An upgrade camping with shady camping spots, extra services and a cool vibe! Only valid together with a Siesta camping ticket! An upgrade camping right next to the K Bridge entrance can put your sleeping spot on a central location! Enjoy some rest at a wooden house, while breathing in the atmosphere of the festival! Only valid together with a Bridge Camping ticket! Cute and practical wooden hut, comfy for 2. Care about the environment? Our ecofriendly slow life campsite is made just for you! What makes this space an eco camping? Bring your kids and enjoy your ultimate festival time together with extra family services! The camping can only be used by families with at least one child under the age of 14. Free for children under the age of 14. Bring your own caravan and enjoy your own well-known comfort in this specially allocated upgrade camping! Entering with caravans and campers​ only, Station wagons with folded down back-seats, or microbuses with laid down mattress are not accepted in the Caravan Camping. Includes a Caravan Camping pass for the caravan itself and Caravan Camping and VIP Camping entry for driver and passengers (maximum number of entries is determined by the capacity of the vehicle defined in the registration book). Any vehicle pulling the Caravan has to be parked outside the camping area in a dedicated parking lot. A 300 euro deposit will be applied when the pulling vehicle enters the camping. This will be returned when the vehicle leaves the camping area. Flexotents offer you spacious tents with comfortable beds at Sziget! Rock solid design, lockable door, 12 volt solar power, and wooden beds for 2 people. Rock solid structure, lockable door, 240v power, and wooden beds for 2 people. Safe and sound accommodation for 4 people. Lockable door, wooden bunkbeds for 4 people. Exclusive Drum and Bass, R'nB - Hip-hop and Techno boat parties in the heart of Budapest, right on the Danube every day from 8 Aug ‘till 13 Aug. Check out Budapest's historic buildings and breathtaking scenery while partying aboard the "Europa"
This any day ticket can be exchanged to any of the 6 boat parties (8-13 Aug) at a later point. Use all public transport possibilities within the city borders and enjoy the best spas Budapest has to offer with the help of this special pass for 13 days. Use all public transport possibilities within the city borders and enjoy the best spas Budapest has to offer with the help of this special pass for 5 consecutive days of your choice during the validity of the pass. Use all public transport possibilities within the city borders and enjoy the best spas Budapest has to offer with the help of this special pass for 2 consecutive days of your choice during the validity of the pass. Valid from the day of validation till the end of the next day (23.59h) , between 3 August and 15 August. Guarded Lockers located in one of the campsites are only valid together with the given camping upgrade ticket! Valid from 6am on the first day until 8am on the morning after the last day.